I feel like we’ve all been there at some point in our practice (right?) when you see other people in the room effortlessly getting into a posture that in your head is simply impossible for the human body to do…. just me? Or, when you are at the barre shaking like crazy, maxed to your limit and the person next to you seems to be barely breaking a sweat…. just me? 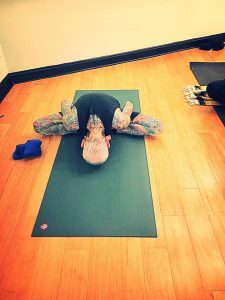 I’m sure that over time and once you become more advanced those moments become less and less, but being relatively new to the yoga and barre practice those moments come quite frequently for me. It can be super frustrating at times! One of my friends, who is a lawyer in New York City, was telling me a story about a lady who she sees at her yoga studio all the time who is super flexible and strong. My friend said she had convinced herself for over a year that the lady was in cirque de soleil and that’s how she could get into some many advanced postures, only to find out recently that the lady is also a lawyer in the city. Needless to say, my friend was a little disappointed to no longer have a reason explaining how this lady was so much more advanced. I’ve totally been there. Sometimes I look around the room during yoga class and see people (at times, everyone) doing a posture I simply haven’t worked up to. Or, I can barely lift my leg off the ground anymore in barre and you see those people who make it look effortless. It’s easy in those moments to get frustrated or make excuses in your head about why those people are so much more advanced than you are. It’s easier to just pull back into child’s pose or drop your leg and feel like you will never get there. But, that’s not what yoga and barre are all about. It’s not about looking around the room or comparing your practice to other peoples. It is about listening and working with YOUR body, building up YOUR strength and deepening YOUR practice. It can be so hard at times, but it’s such an important thing to remember on your fitness journey. One of the things I have found helpful is thinking about the ways I am improving and being proud of all the things my body can do instead of what I struggle with. 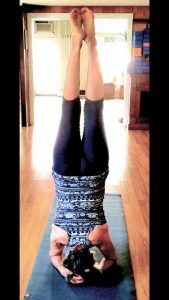 For example, I am still working to find my strength and building up to getting into pincha mayurasana (forearm balance pose). This was a source of frustration in my yoga practice until I started to really think about it and read more about it. Pincha, like most advanced yoga postures takes patience and time to accomplish. Another yoga posture I struggled with at first was sirsasana I (headstand pose) but after a couple of weeks and figuring out the correct body position I was able to get up into it. I was so proud of myself when I first figured it out! Focusing instead on my growth and successes instead of being frustrated over poses I haven’t mastered yet has helped me stay more positive and trust in the ability of time and effort to deepen my practice. We all have different types of bodies, have been practicing yoga, going to Barre and working out in general for different periods of time. People deal with different mental and physical blocks whether it be fear, injury or something else. In the end, it doesn’t matter what the person next to you or the other people in the room are doing, it’s all about your personal practice and you personally working to better yourself every time you come to the mat.